Never under-estimate the importance of formation in The Legacy of Holy Castle. For the same number of units that can handled by your hero and the same number of defensive building you have, how you place your buildings and your units is the only factor that you win or lose a battle. My castle was attacked everyday recently and it is a very good chance for me to experiment with several defensive formation. I tend to rely quite a bit on the usage of defensive buildings, especially the self-detonating towers, as they can deal quite some amount of damage to enemy units. 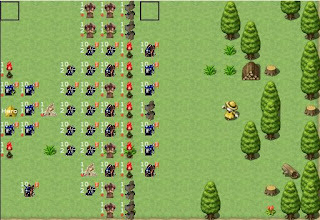 Putting the line of self-detonating towers right at the front has the advantage that they can destroy quite an amount of enemy units right at the beginner, weaken them so that they can deal less damage to our units. The disadvantage is that if the enemy knows your formation, he can produce weak units with amount 1 at the frontline to take the damage from the self-detonating tower, which can waste your self-detonating towers. That's the reason why I put a line of elite hoplites the front to take down weak units first, and allow stronger units next taken down by the line of self-detonating towsers. Next are the ramparts and the arrow towers. Putting arrow towers right behind the rampart as the ramparts are extra strong in defense. When the enemy units take several rounds to destroy your ramparts, they had already taken up quite an amount of damage from the arrow towers and the archers. Putting hoplites and self-detonating towers around your hero is important, as whether your hero survives determine the win or lose of the battle. These are the last line of defense, so that any enemy units approaching your hero should be taken down by the body guards. Do you have any good formation to suggest? If so, feel free to leave a comment. Nations States is quite an interesting and special game, which can't find other games with the same genre on the market. Nations States is a nation simulation game created by Max Barry and based loosely on his novel Jennifer Government. The game play is simple, you are the ruler of a country. Everyday there will be a political issue come up at your nation, and your prime ministers and advisors would have several argument over the issue. As a ruler, you need to make decision on the issue, based on your ideal and political standpoints. Your country will gradually evolves based on your political direction. There are several attributes that will evolves: ecomonics, civil right and political freedom. There is no competition in this game, the country will never war against each other. It is only simulation. This game is quite relax and you need only login once per day for choosing your solution towards the political issue. In FallenSword, if you want to optimize the experience gain, besides optimizing your usage of stamina, you need to make sure you are killing the right monsters. For experience point gain by killing monsters, you get 120% experience point gain for killing a monster 1 level higher or above you; you get 100% experience point gain if you are killing a monster at the same level as you; you get 75% experience point gain for killing monster a level lower than you; and you get 50% experience point gain for killing monster 2 levels lower than you. Therefore if you are at a map with several different monsters with different level, you need to always check the monster level by viewing them. If possible, always kill the monster at least the same level as you, and ignoring the monsters with level lower than you in the same space, unless the map is running out of monsters.